When leading a healthy lifetime, snacking can be a huge downfall. But now, there is no need to go hungry between meals. Below we offer some great ways to keep your metabolism boosted with delicious and healthful snacks. Some of these meals have absolutely irresistible taste, and do not forget, all are healthy as can be! Meals with excellent taste and health- friendly? -- Yes, please! 1. Garlic Toast Crackers with Prosciuto and fresh Mozzarella -- Impress your guests with this fancy, healthy snack. 2. 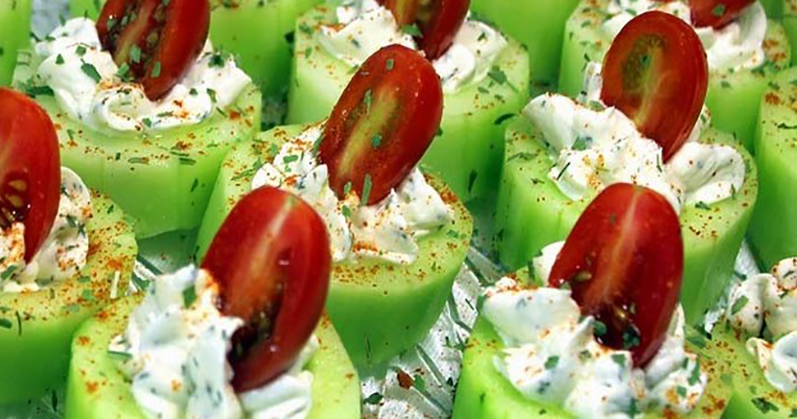 Mediterranean Cucumber Roll- Ups -- These roll- ups are delicious, with feta, hummus and peppers. 3. Baked Zucchini Chips -- Far from the average potato chips, these are healthy and delicious. 4. Cauliflower Crust Mini Pizzas -- Very few carbs, and all that we love about pizza. 5. Fruit Bites Covered with yogurt -- Prepare them easily, just coat your favorite fruit with yogurt, freeze and enjoy! 6. Cottage Cheese Guacamol -- Boost the protein in your diet by adding cottage cheese to your guacamole. 7. Peanut Butter Honey Yogurt Dip -- Sweet, tasty and extra healthy. 8. Cucumbers Stuffed with Herb Cream and Cherry Tomatoes -- Incredibly delicious and simple. 9. Healthy trail mix -- You can choose and mix up your own. 10. Baked Carrot Chips -- Brush carrot slices with olive oil, and just put them in the oven at 375 for 10 minutes. 11. Cheerios and Peanut Butter Bars -- This recipe can substitute other cereals, and are just extremely tasty. 12. Butternut Squash Chips -- These chips are also super easy to prepare. Simple, Healthy, and Delicious. 13. Vietnamese Spring Rolls -- When you need an amazing snack, just wrap fresh shrimp, veggies, mint, and herbs in rice paper. 14. Dried Apple Chips -- These great snacks can be even made in the microwave! 15. Banana, Chocolate, and Almond Butter Bites -- if almonds aren’t your thing, you can substitute peanut butter to make them. 16. Granola, Peanut Butter, and Apple Sandwiches -- Sweet, Crispy, and Delicious. 17. Spicy Sriracha Popcorn -- Add Sriracha sauce to some butter and drizzle over freshly popped popcorn. Simple and delicious. 18. Avocado Toast with a Sunny-Side up Egg -- Instead of butter, spread avocado on a piece of toast and add an egg. 20. Ants on a log -- This is a classic snack idea, using some new twists. 21. Greek Yogurt Ranch Veggie Dip -- This dip is loaded with proteins and so tasty!